Veteran comedian Ken Dodd is clocking up six decades in showbusiness, he tells Graham Young why he is still fizzing, ahead of his show at the New Alexandra Theatre in Birmingham. Ken Dodd is in the kind of buoyant mood which befits a man happily celebrating his own Jolly Jubilee. “I’ve got a new range of tickling sticks – made with virgin wool,” he says. As in Sir Richard Branson? “No,” he chuckles. “As in ewe. Born on November 8 in 1927, Ken made his professional debut at the now demolished Nottingham Empire in September, 1954. It was a gig that put him on the road to a non-stop career that will see The Happiness Show arrive at the New Alexandra Theatre in Birmingham on November 22. And Ken Dodd’s Merry Christmas Laughter Show at Wolverhampton Civic Hall on December 14. “I’m like a human yo-yo, playing everywhere from Scotland to Cornwall,” he says. In his prime, coal merchant’s son Ken was what you might call a big strong lad. Age might have weathered him physically, but his mind is alert as ever. And when he’s not clearing his throat with a cough he puts down to asthma, there’s still a rich baritone sound to a voice that saw him topping the UK charts at the height of The Beatles’ power. More than that, in the mid 1960s he also had a record-breaking 42-week run at the London Palladium – playing twice a night and three times on Saturdays – and he smashed the panto record at the Birmingham Hippodrome with Humpty Dumpty. It all began with 10 years’ training in social clubs and “hot pot diners” of Merseyside, where he mashed up the humour of the Irish, Welsh and Scots in his own multicultural melting pot. What advice would he give himself now before that first gig in Nottingham? “To not be so frightened,” says Ken. “It was very daunting, though. Any first night is daunting. “I learned to love an audience and to look them straight in the eye when you go on. “After Nottingham we went to Leeds, Sunderland, Glasgow, Middlesbrough and then down South to places like Chiswick and Brighton. Although Ken isn’t one for looking back, how does he reflect upon the decades now? “Humour is always changing, but some of the things that people laughed at in 1954-55 are still the same today,” he says. “Husbands and wives, lovers, boyfriends and girlfriends... those things would work in the Midlands and up North, but audiences down South were more interested in money. Ken Dodd holding tickling stick and a diddy man. “In Liverpool they love their football – I once played at Anfield as an inside right in a losing schoolboys team – and in Scotland they’re abrasive. “The Glasgow Empire was like the house of terror. Ken was recently given a poster of that first Nottingham show. “My name was at the bottom, just a bit bigger than the printer’s,” he says. “Kenny Baker was at the top of the bill, a trumpet player. 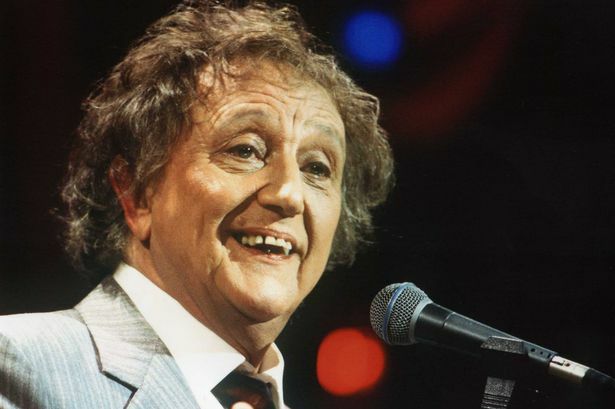 “They didn’t know what to call me, so I was billed ‘The unpredictable Ken Dodd’ and I just worked my way up from there to topping the bill at the Palladium. “What I can say is that in 60 years, I’ve never done the same show twice because each audience is comprised of different personalities. “You have to work out where the hot spots are. “Who has got the good chuckle muscles? Who needs coaxing? Who can you flirt with? Ken says he refuses to use religion and politics as subjects. “Those are for you journalists,” he says, detailing a preference for his own staples such as Christmas (for winter shows), MPs expenses and... horse meat. Two years before they turned professional, he remembers working on a show with The Beatles. “One of them, and it must have been Pete Best around 1957-58, was playing a packing case,” he recalls. Ken is not averse to talent shows, providing they don’t ridicule the participants trying to do what they might have spent years practising. “I was on Marti Caine’s New Faces panel when we had Joe Pasquale come on with his squeaky voice and I said he would become a big star. “Programmes like Opportunity Knocks, were great shows. I wonder how he sees the decades of his career now in retrospect. As they did for Doddy in the 1960s. Tears by Ken Dodd, a single cover from 1965. Besides those record-breaking theatre shows, he had a string of hit singles and topped the charts with the best of the lot, Tears. Given the fates of stars like Jimi Hendrix, Janis Joplin and fellow comedian Tony Hancock, did he have to keep his feet on the ground in the Swinging Sixties? Despite the 70s being torn by strikes and power cuts, he doesn’t look at the decade negatively. “People needed to laugh more than ever before. I don’t think those years were worse than any other times. His late brother only packed in delivering coal 10 years ago, but Ken still sees the 1980s in a good light despite the year-long Miners’ Strike in 1984. “What have we got now? “Coloured bracelets to remind you of something you would have forgotten anyway. “The electric car, so that you can’t hear it running over you? “I’m still practising, still learning and hoping that I’ll get it right one day. But while there’s clearly much happiness there, what about the fate of many people he must have known and worked with over the years – from Stuart Hall, to Dave Lee Travis and Rolf Harris? “I feel very sad about that, but it’s part of life,” he reasons. Of course, Ken had his own time in court prior to being cleared of tax evasion 25 years ago in 1989. Though unquestionably stressful at the time, was it a good thing in terms of putting his name in the limelight and giving him a whole new string of gags? Once again, the curtain comes down. “Remember Mark Twain’s words, ‘History is bunk’,” Ken quips. “It makes your neck ache looking back. Accountancy is no joke, but we’re all dependent on people helping us, just like we are in a show. He has lived in the same Merseyside house for years, a 1782 Georgian farmhouse in Knotty Ash. Ken admits to being untidy, but does he know where everything is inside? Partner Anne Jones – who uses the stage name Sybie Jones for her music act in Ken’s variety shows – frequently chides him, but he’ll have none of it. “She keeps telling me not to bring any more books home, but I do,” he says. “I’ve got thousands that I’ve spent 75 years collecting. “I’d like them to go somewhere – not a museum, that sounds too dusty – where they can help people interested in showbusiness to learn. There are storage facilities everywhere in Ken’s house. His first ventriloquist dummy, Charlie Brown, lives in the attic. And Ken certainly has no intention of retiring. Not while the going is so good. * Did you know that a laugh is something that comes out of a hole in your face? Anywhere else and you’re in dead trouble! * Do you know what they call people who are born in Chesterfield? . . . Babies. * How do you make a blonde laugh on a Sunday? Tell her a joke on a Wednesday! * If you don’t laugh at the jokes, I’ll follow you home and shout them through the letterbox. * How many men does it take to change a toilet roll? Nobody knows. It’s never been tried. * When we do an early show we get a lot of pensioners. It’s like a scene from 50 Shades of Beige. * On the length of his show: Most of you will have been reported missing by now. * Age doesn’t matter unless you’re a cheese. * A man retires when he stops doing what he doesn’t want to do, and does what he wants to do. * Comedy should never be over-analysed. It is either funny or it isn’t. There is a subtle difference between those who say funny things and those who say things funny. * It’s one of your opening lines when you get to a mature age. You say ‘How wonderful to be here . . . actually, it’s wonderful to be anywhere’.